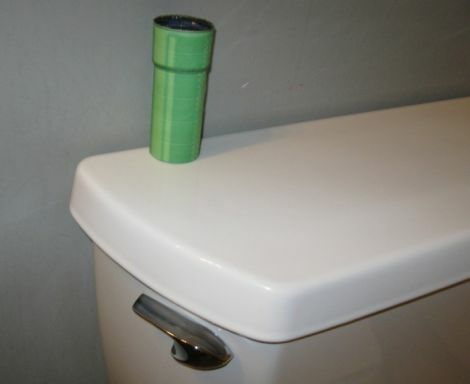 After reading about a Super Mario Brothers themed bathroom, [Jonathan] decided that it would be pretty cool to have his toilet play the “warp pipe” sound whenever anyone flushed. He grabbed a small sound drop key chain on eBay and disassembled it to see how things worked. Once he figured out which solder pads corresponded to the warp pipe sound he added a few wires that, when shorted, trigger the sound effect. He debated as to how the sound generator should be wired to the toilet, and was pretty reluctant to place the key chain inside the tank due to concerns about sound volume and water damage. He ultimately decided to trigger the sound effects using triboelectric charge, much like those touch lamps from the ’80s. He rigged up a simple circuit that is connected to both the toilet handle as well as the water intake valve on the wall. When someone touches the handle, the small charge that is present in their hand triggers the sound effect as you can see in the video below. Instead of using a standard project box, he opted to build a small warp tube replica from cardboard and paper, which really brings everything together nicely. While he says that the circuit is pretty sensitive, triggering at odd times or not at all, we still think it’s awesome. An alternative trigger would be two wires dangled in the water making a circuit. When the water level drops the wires become disconnected; triggering the sound. Current drain would be an issue though, so a float switch could be employed also. Needs to be LOUDER! I don’t think anyone would hear that over the water. No need to dangle any wires in the water. Rig it up so the loud sound of the toilet flushing triggers the sound generator. I wonder what sounds will be immediately recognizable to me in another 26 years. The sound of world 8 continues to instill fear and anxiety in me to this day. @Decepticon Looks like the noise maker plays its tune before the toilet is flushed. Would this ever freak some young kid out to point they would become fearful to flush the toilet? Magnet in handle and reed switch in tank on other side. @kakureru: use a Kinect to watch the turds and trigger the sound when they disappear. Sensing the water level and a reed switch are good ideas for making it more reliable. I was a little wary of putting things in the reservoir for fear of it coming unstuck and clogging the pipes. I’m think wrapping wire around the base resistor, like we saw in that high voltage probe last week, would help balance out the charge between the input and ground, and therefore make the circuit trigger more reliably. It’s not that quite. Though now I wish I’d sealed the top with something that acts more like a diaphragm. I sort of wished I’d timed it to play just when the bowl empties or added a switch or randomizer so it plays one of the other sounds, but I find that when I start adding complications to short, simple projects it really erodes the fun. I also like that I can do a demonstration without actually flushing and wasting water. Now I have some good ideas for version 2.0 if I ever want to make another, perhaps as a gift. Needs a photo sensor to detect when something is going in the toilet. Each time a turd drops in it plays a sound.